I know you are thinking YES, but loving music and using regular wired earbuds are no longer the best option like they used to be. Having wireless earbuds offers a level of convenience that you simply can not get with a wired set of earbuds. This convenience is especially important for people who enjoy working out and being active. 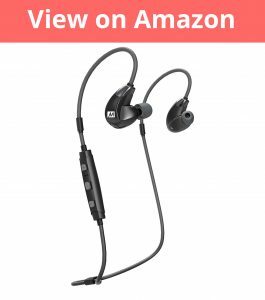 Though while Bluetooth earbuds offer a level of practicality you also have to consider some other elements when purchasing when compared with traditional wired headphones. Things like battery life and the wireless range of the earbuds should be considered alongside the other typical important aspects like sound quality and comfort. I have used and tested over 50 different kinds of wireless earbuds and below are the best options where I will provide you all the information you need to make the best decision. 10. Jaybird X3 – Best Wireless Earbuds? Jaybird somewhat got their name for the previous model called the Jaybird X2s – one of the top rated wireless earbuds. The X2s where one of the best options on the market for some time. So, it only made sense for them to build on that success with the X3s. On paper things have been improved and adjusted to make them better in every way from their predecessor. But does this transfer to a quality set of earbuds – let me explain. Inside the Box – Once you open the box, you have the headphones themselves, a carrying case with the Jaybird logo that is relatively small. You also get the wingtips, 3 sets to be precise, along with 3 different sizes of earbuds – 2 of each size, 1 set is made of a memory foam material and the other is a typical rubber kind. There are also some clips which you can attach to the cable and then unto your t-shirt for example. The usb charging cable is also there along with the usual quick start guide and instruction manual. Design and Comfort – When comparing the design to the previous model the X3’s got quite a nice makeover but still remain with a relatively similar design. It’s like a refinement on the X2’s. They are definitely smaller and more lightweight than the X2s which was one of the X2’s downsides. Also, when wearing them they are more comfortable and they have a nice fit. The adjustability with the wings and the changeable earbuds definitely helps with this. Further down the wire you have the controls along with a built-in mic. This is one of the major changes when compared with the X2. The X2s had the battery built into the earbuds themselves whereas with the X3s it’s built into the controls. Though I was a little worried that may weigh them down I was surprised that is does not, though it is slightly heavier than a regular control module, it doesn’t put any strain on the ears when wearing which is the most important factor. Wings on earbuds – some people simply don’t like the idea of them. But here I can say Jaybird really did them well and I can imagine most people getting used to them and starting to love them after a little usage themselves. When it comes to sweat proofing, they have what is called a hydrophobic nano coating. In comparison to a typical waterproof coating this is slightly inferior but it still does the job in most instances. 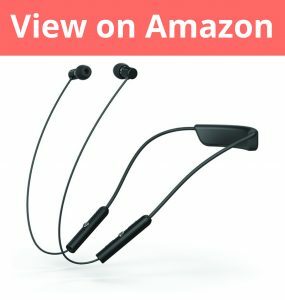 Battery Life – The battery life on these earbuds is solid, in my usage I was getting 7-8 hours of playback on high volume which about matches the Jaybird X2s. So, nothing spectacular but still a solid offering. Sound Quality – Overall the sounds have a nice mixture right out of the box. The mids and trebles have a nice distinction, along with the bass being quite punchy. It’s a nice mixture overall. It’s also worth noting there is an app called Jaybird MySound. The app allows for customization on sound profiles and allows for things like increasing bass. Connection Quality – The X3’s has Bluetooth 4.1, which allows you to connect 2 devices to the same audio source which could be ideal if you are working out with a friend for example. The range on these is pretty great and remains effective up to about 25 feet. When it comes to consistency, they are not perfect but pretty close. In my typical workout they would stutter once in a while. Maybe once or twice an hour roughly. When comparing with the predecessor the X2s, these are without a doubt a refinement that slightly improves on a lot of areas and an already very popular and quality product the X2s. You get all the improvements and at a lower price point than the X2s. It’s definitely a great choice of earbuds can I can wholeheartedly recommend. Powerbeats are a high-end pair of earbuds that are designed with a lot of important features in mind. They are clearly targeted for someone who loves to work out and jam to some tunes while doing so. Along with providing great audio quality and being fully waterproof are a few elements I particularly like. Let me explain more. Inside the Box – In the box you get the earbuds themselves with the built-in hooks with the common red and black coloring style from beats, though there is a plethora of other color schemes. There are 3 additional sets of ear tips included in the box so you can get the best fit possible. There is also a carrying case included, usb charging cable, warranty card and quick start guide. Design and Comfort – When it comes to design they aren’t the classiest looking earbuds but they have been designed more with practicality in mind and that’s where they shine. As you can see they have the hooks which do exactly what they are meant to do, stop your earbuds from falling out. The hooks are made from a rubber material – they are comfortable on the skin and they don’t feel tight. They are also quite lightweight and they don’t create any burden when working out. They are also fully waterproofed preventing damage from sweat etc. There is also an inline remote control where you can pause/play and adjust the volume, it feels really premium – the buttons are nicely tactile. Battery Life – The battery itself is built into the main body of the earbuds. While this makes its bulkier it isn’t a burden. One of the greatest selling points with these Powerbeats is the battery life. They last 12 hours on a single charge which is exactly what Beats claim. They also have a nifty charging feature – if your earbuds are empty on battery simply charge them for 5 minutes and this will give you an hours’ worth of listening. This can be useful sometimes and an hour is typically enough for the average workout. Sound Quality – The sound quality is very good partially thanks to the superb connection quality. Bass is higher than most other earbuds. Though it’s not over powering – it feels tight and adjusted well. If you enjoy bass these earbuds will satisfy your craving for sure. Overall the audio is crisp – you can clearly hear all the fine details in every track. Though on softer tracks the bass may be a little over tuned. Connection Quality – If you are an iPhone or iPad user these are undoubtedly a great choice – reason being that they have an integrated Apple W1 chip built into them. The chip basically makes connecting to the iPhone a breeze. Though even on android it still is simple to connect. One of the things that impressed me was the connection. It was always consistent and crystal clear – very impressive indeed. These earbuds are great, they have a unique design that may not be to everyone’s taste but they are premium. They are waterproof, with crisp audio with plenty of bass along with excellent connection quality and consistency and have the Apple W1 chip inside. Though they are on the higher end when it comes to price point you get what you pay for here! Though the Sony SBH80s are not the newest set of earbuds on the block that doesn’t mean they aren’t a great product whatsoever. Most notably having the band that rests on your neck these Sony headphones have a unique design that looks surprising classy when worn but how does the other important features fair? Inside the Box – In the box you have the headphones themselves, along with the usb charging cable and a couple extra rubber tips including the set that are already on the earphones making for 3 total sets. There is also an instruction booklet inside but no carrying case to be seen. Design and Comfort – The design of the Sony SBH80s is without a doubt one of its selling points. On first glance when I saw the neck band design I was a bit skeptical but once you are wearing them they have a classy and elegant look that I was pleasantly surprised by. One of the major elements of the neckband is that it is designed to take the stress of the earphones, which basically equates to less strain on the ears and generally a much more comfortable experience. You have controls on both sides for pause/play, volume adjustment, back and forward track skipping and answering calls. Sony has also attached the headset name to these earbuds because of the mic setup. This is because there are 2 mics on board which makes for calling much clearer and ideal for business professionals. Also, there is built in vibration built into the band, so when someone calls you it will vibrate which means you never will miss an important call and it’s a really intuitive feature to have. 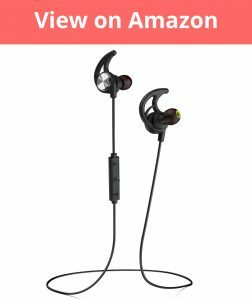 In terms of overall comfort, I was impressed, the design helps with creating less strain and pressure on your ears especially when working out. So, you could use them for a long workout with your ears feeling sore. These earphones are not waterproof which is a little disappointing though they still can easily be used for working out, though if you like to run in the rain they are definitely not for you! Battery Life – On the neckband there is an LED which displays a color based on the remaining power left, green is 100% – 30%, Yellow is 30% – 5% and red is 5% – 0%. In terms of battery life, I was able to get about 6 hours on one charge listening to music though if you are using it for calling only you can get 8 hours according to Sony, though in my test I did I got 7hours 20 minutes. Recharging takes about 2 hours from empty. Sound Quality – The overall sounds quality is crisp and has a good sound stage with slightly above average bass. They are good value when it comes to audio quality compared with other earphones. Connection Quality – These earbuds use Bluetooth 3.0 and I had no problems pairing them with a host of different phones and tablets. The range of these is very good you can easily leave your phone in your bag at the gym and as long as the signal doesn’t have to travel through walls it will be very consistent even at long ranges. These earbuds are clearly ideal for someone who needs the ability to call wherever they are on the go – their voice audio will be clear and crisp. 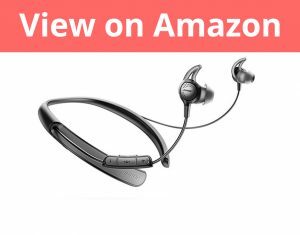 Their sound quality is very good, along with being very comfortable and elegant, they are an easy recommendation to make. These Boss earphones are designed to be nose cancelling and have a neck band design. They carry a hefty price tag but are they actually worth every penny Boss is asking for them? Lets find out! Inside the Box – In the box you have the headphones 2 extra sets of ear tips including the set that are already on them, a micro USB charging cable and instruction and warranty booklet. There is also a hard circular carrying case. Design and Comfort – These are the first kind of neckband design that Boss have ever released. The neckband is primarily used to help reduce the amount of pressure on the earbuds when you are wearing and it does just that. On the inside of the headband you have a single button for powering on and 2 LED’s, one for Bluetooth connectivity and another for battery power. The is also a flap that can be lifted to reveal the micro usb for charging. The design is simple and rather minimal but I personally like it for its subtle design. The control module is located in the wire on the right side. It has all the functionality you need, from pause/play, changing track back and forth, as is common with most earbuds like this. There are also an additional 2 buttons on this one which allows you to configure and adjust the amount of noise cancelling you would like. This is a unique feature that works incredibly well and could be invaluable in certain noisy/louder environments. When it comes to the ear tips design they are designed to be the perfect fit for the average ear. They do not have a circular design like a lot of other Bluetooth earbuds but I personally love how they fit. They are definitely one of my personal favorites when it comes to fit. Though it’s worth mentioning that you can’t use other ear tips because of the unique design only the ones Boss have included will work. Battery Life – Boss claims that these earphones have a 10-hour battery life and in my usage I was able to get about 9 hours 30 minutes which is about right. 10 hours is a very good amount of battery life especially considering the noise cancelling functionality. Though I would have hoped for a little more especially considering the high price tag on these, though 10 hours should be plenty for most listeners. Sound Quality – The sound quality is where these Boss earbuds really shine. They offer a full sound that provides a consistent high quality from the Lows all the way up to the Highs. The bass is also about right for what I like, its slightly heftier than average. When it comes to sound quality you must also consider the noise cancelling factor which for some people is a massive selling point. Boss have named them QuietControl for a reason and this noise cancelling feature works like a dream and does an impeccable job at cancelling the noise. If noise cancellation is an important factor to you this should be top of your to buy list. Connection Quality – The connection quality on these is rather good, when you are close to your device(<20ft) the connection remains consistent and perfect. Though when you start to go further(20ft-25ft+) they start to skip and have connection issues. I personally would have hoped for a little better considering the price tag. They also have NFC which makes connecting with compatible NFC devices super simple. The Boss QuietControl 30 are overall a great set of Bluetooth earbuds but they are not perfect. They have amazing sound quality, with some of the best noise cancellation on the market, along with being incredibly comfortable. Though the battery life is a solid 10 hours I would have hoped for more along with the range being lacking when compared with other high end products. They are a contender for the best Bluetooth earphones and one of our top picks! MEE Audio for most people isn’t a recognizable brand but as you are soon to find out there are slowly but surely becoming a serious contender to the likes of Bose and Beats, this is because of their quality they provide and this is no different with the MEE Audio X7 Plus – let me explain. Inside the Box – In the box you get the earphones, a selection of different sized ear tips, a micro usb charging cable and a hard-carrying case, along with the normal paperwork. Design and Comfort – These are in black, with some grey accents along with a little chrome on the bottom of the earbuds. The inline control is strong and the buttons are nice and responsive. They have volume control buttons along with pause/play button which doubles as an answer button for calls, and yes there is a mic built in there as well. The top bit of the cable which is designed to go around your ear is what they call memory wire, basically all this equates to is wire holding its shape better. It allows the earbuds to hold in place when wearing them. The general fit on these earphones was great, I found a nice fit on a set of the ear tips, and when you are wearing them behind your head they hold it place well. 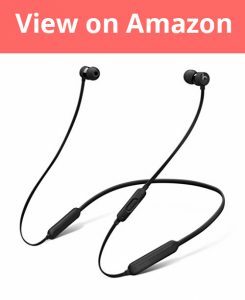 Definitely a solid choice for someone who is doing a rigorous workout and one of the best sport Bluetooth earbuds out there. The once clear downside of this design is that if you want to use them for calling and you are wearing them behind your head then the microphone will not pick up your voice well if at all. So, you will likely have to unplug the right-side ear so you can actually talk and have the mic pick up your voice clearly. 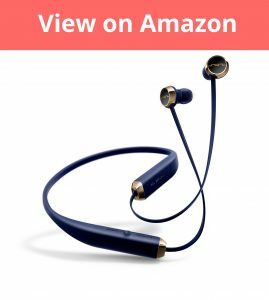 Battery Life – Considering their price point the battery life is good at about 8 hours of playback time in my testing and after reading Bluetooth earbuds reviews of similarly priced earbuds these are a good choice for battery life. Sound Quality – These earbuds have a 6mm diver which is really high quality. The bass is strong – it’s a well-defined strong that really goes well with high energy music. They also produce a quality sound stage that is on power with some earphones that are over double their price. So, value for money in terms of the audio is amazing! Connection Quality – Pairing with the phones I tested it with was a breeze and really simple. In terms of connection quality and consistency they are some of the best. I not once had the audio stutter or connection problems, it always remained consistent. Range was tremendous and remained consistently connected up to about 30 feet, and that was with walls in between too. Without any obstruction you can even get over 35 feet of range but for reference 30 feet is a safe bet even with obstructions in between. This is one of the best options when it comes to having an excellent range. When comparing these MEE Audio X7 Plus with the competition I see a lot of quality in all the right areas and at a very reasonable price point. 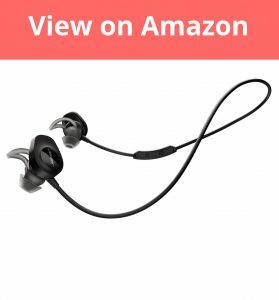 They have great sound quality, one of the most consistent and reliable wireless connections with a high range and they are comfortable and stay in place even when doing some rigorous workouts. The only downside being if you want to the integrated microphone you really should unplug an ear to get the microphone to pick up your voice clearly. The Sol Republic Shadow Wireless are without a doubt one of the best earbuds when it comes to appearance alone. But do they stand up when it comes to the important areas like comfort and sounds quality – time to find out! Inside the Box – In the box you get the headphones, a USB charging cable, a set of different sized ear tips, a quick start guide and a carrying pouch. Design and Comfort – When it comes to design and looks alone this are one of the best looking earbuds I have seen. They look really classy and elegant and are available in a selection of colors which all look great. The design of these earbuds are a neckband design. The neck band is one of the best neckbands I have worn when it comes to comfort. It contours the neck well and is has a rubber coating which really helps. That rubber coating makes them fully water resistant along with the earbuds themselves, for a fully water-resistant product which is great. On the band itself is where the buttons are, there are buttons for volume adjustment and a universal button for skipping/pause/play and answering calls. As you would have guessed the battery is stored in the band itself along with the micro usb port which has a latch that seals it when not in use. There is also an LED which has some lighting patterns for low battery, powered on, charging etc. Battery Life – I was relatively happy with the battery life which provided me with about 7-8 hours of playback time which is well above average. When the battery life is running low you will get an audio notification in a male voice saying that your battery is low which is a nice touch instead of beeping or the like. Sound Quality – I was impressed with the sound quality overall. They provide a great full sound with a nice bass – a deeper bass that I personally loved how it was balanced just enough but not too much on those harder hitting songs. They aren’t as perfectly crisp as some of the most expensive options out there but considering the price the value for money is extremely good. Connection Quality – These Sol Republic earbuds have Bluetooth 4.0. They also have aptX which basically is meant to make streaming sound over Bluetooth sound better. Though I was impressed with the connection quality and consistency I am dubious about it being aptX that caused it. When it comes to the range they work well up to about 30 feet and as I mentioned they are consistent and rarely stuttered for me in my usage. If you are looking for a set of earbuds that is stylish and looks the part then these shadow wireless are a great option. Not only do they look the part but they provide great audio fidelity and are 100% waterproof and all at a reasonable price point. The only downside I can really find is that the microphone doesn’t pick up your voice well particularly in a noisy environment like a gym. Apart from that they are a great buy. 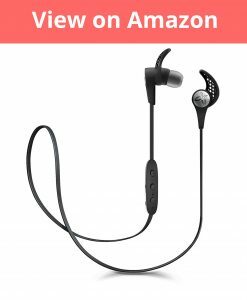 NuForce BE6i Wireless are a mid-ranged price set of Bluetooth earbuds that has quality in all the right areas with very little downside. Let me explain why below. Inside the Box – Inside the box you get the headphones themselves along with 5 extra ear tips in the common silicone material and 2 more packs of foam tips in the medium and large size options. There is also one set of wings and a divider cable as well need be. And finally the charging cable and the usual paperwork included. Design and Comfort – The earbuds themselves look amazing. They are made from a brushed aluminum which looks and feels high quality. The cable feels strong and well-made and due to its flatter design stops it from getting tangled. Also, the backs of each the earbuds are magnetic which means you can attach them back to back to each other with makes storage of them much tidier and convenient. There is also an inline control with built in mic which has the usual volume up and down functions along with a multipurpose button for pause/play/answering calls, and you can navigate back and forward tracks by holding down either volume button to skip forward for 1 second, back for 2 seconds. All the instructions can be found in the manual though if you need them. I must mention the controller doesn’t match the quality of the earbuds themselves it does feel cheaper for sure. In terms of comfort for me personally I preferred the Comply foam tips which are included in the box. They are a better option when it comes to ear tips and usually have to be bought separately. A pack of 3 can usually cost you around $20 so for them to include 2 in the box is a nice selling point. They are very comfortable especially if you are used to wearing the common silicon options. You can think of the material as almost a sponge that holds its shape well. If you are someone who needs their earphones to stay in ear you will likely want to use the wings so it’s a disappointment that they have only included one size which certainly won’t fit everyone. Though excluding that I like the feel and design overall. Battery Life – While they won’t break any records when it comes to battery life though they do provide a solid 8 hours in my testing, which is well above average. Sound Quality – These headphones have a 10mm driver which yes makes them a little heavier and bulkier than the traditional sized driver though them small downsides are more than made up for which the tremendous sound quality. Due to this larger driver, it not only provides you with more volume but also amazing detail and fidelity in the mids and lows along with the booming bass that to me feels powerful enough without being over tuned. So, it’s really a mixture for success. Connection Quality – They are powered by Bluetooth 4.1 and they have an amazing range capability. In my testing, I was able to get about 60 feet of consistent connectivity. With is really incredible. Though I have read about some other users getting nothing of the sort. This is usually device dependent. A general rule of thumb is if you are using a relatively new smartphone you should be able to make full use of this ridiculous range. I personally was using an iPhone 6 in my testing. So keep in mind that if you are using them with an older device or smartphone you likely won’t get this capability. Overall the NuForce BE6i are a great choice. They have a classy and elegant design that’s durable as well. They provide some the best sound quality for this price range along with a good battery life. I can easily recommend them and they are absolutely a great choice. The Phaiser BHS-750 are an offering of earbuds that has been refined, refined from a product that was very well received and loved by the listeners. So really the 750s have quite a lot to live up to when compared with their older brother, but can they live up to the hype? Inside the Box – You get a protective carrying case, 1 set of comply ear tips(foam), 3 sets of regular ear tips(silicon) 2 different styles of wings with different sizes for each and line clips. There is also a micro usb charging cable along with the typical paperwork. Design and Comfort – These earphones have a winged design that can be worn both over the ear and under the ear, both of which positions are comfortable. Though over the ear seems the better option if you are doing a hefty workout. They stay in place a little more securely when in that position. When it comes to the comfort of the ear tips and the wings I was quite happy, partially thanks to the big selection of ear tips and hooks provided in the box. Considering their price, I was pleasantly surprised with how they look, with the metal back I liked the style. I personally had the black cabled option with the silver back. Though there are a host of different bright color options available if that suits your taste. Also, there is a magnet built in the back of each of the earbuds so you can place them back to back and they will connect. This is handy for both storage or keeping them around your neck when you aren’t using them. There is the standard inline control for volume adjustment and a universal button for pausing/playing and answering calls etc. Along with a built-in microphone. Though for the microphone to pick up your voice well you will need to be using them in the common below ear orientation. They are also sweat proof thanks to the liquipel nana coating, and Phaiser claims they can even be dropped into water and they will still work no problem though I didn’t test that myself. Battery Life – Battery life isn’t the best out there but its decent at about 5-6 hours in my usage. Though when comparing with other similar priced products it definitely has a leg up. Sound Quality – When reviewing the sound quality I always have to consider the price. And compared with other earphone around this price point they are definitely way better, though they can’t stand up well against some of the other more expensive options out there. There have an 8mm driver which provides a clear and consistent sound with a commanding and rich bass. They won’t be suitable if you are an audiophile but if you are coming from a pair of Apple/Samsung headphones they are going to be a significant jump up. Connection Quality – The connection and set up was super-fast. Once you have registered the device on your phone anytime you power it on and your phone Bluetooth is enabled it will automatically connect. When it comes to range they are great too. Without any boundaries, I was able to get a consistent and reliable connection up to 40 feet, and though walls it worked well too but the range lightly dropped when passing through a wall by approximately 10 feet less. If you are using them and keep them within range their connection works flawlessly and doesn’t stutter or anything of the like. Without a doubt these are the best Bluetooth earbuds under 50. They have good sound quality, are sweatproof, have a pleasing design and decent battery life and all at a very low price point. 2. BeatsX Wireless – Best In Ear Headphones? Beats have quickly become a household name that is widely recognized. Though they have been known for creating classy products, they often have been criticized for not providing the audio quality that their price deserved – but does this remain the case with these Beats X wireless? 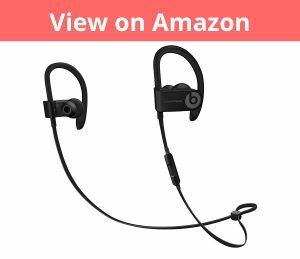 These earbuds are one of the newest offerings Beats has, and also one of their cheapest, though still comparably high when compared with the overall market. Inside the Box – You get the earphones themselves, eartips with 4 different size options, removable wing tips, a carrying case that will fit in your pocket, a lightning to USB charging cable and the common quick start and warranty paperwork. Design and Comfort – Beats became popular because of their high end looks and design and with the BeatsX this is no different. They look classy and feel premium in hand and ear. The comfort with these Beats are one of my personal favorites, they fit my ear perfectly and I could easily wear them all day without feeling any strain or pressure on my ears. The comfort in also thanks to the neckband design which takes most of the slack of the cables and definitely reduces pressure on the ears thanks to this. They are easily in the top 3 Bluetooth earbuds when it comes to comfort. The wire that bring them all together is typically worn around the neck this too helps with comfort because it reduces the pressure on the ears because it rests on the neck. The wire has a flat design which feels strong and stops it getting tangled when you store it. You also have the standard inline controller, which has the volume adjustment buttons along with the universal button using for play/pause/answering calls and skipping tracks. There is also a built-in microphone. On the backside of each of the earbuds are magnets which can be handy when storing them or you can attach them when you are wearing them like a necklace. It’s useful and definitely makes losing them basically impossible! Battery Life – The most notable thing with the battery is that it has a quick charge feature. Basically how it works is if your earbuds are dead on battery but you need to use them you can charge them to 25% power in about 5 minutes. Therefore giving you 2 hours of playback time with a 5 minute charge which is super convenient and useful in plenty of situations. When the battery is at full you can expect 8-9 hours of usage which is above average but nothing spectacular. Sound Quality – The general balance between the lows, mid and highs here have a nice level. You aren’t going to experience anything too outrageous though. They definitely don’t have the audio clarity of some other earphones out there and when compared with their common rival the apple airpods there are strikingly better, not that the airpods are the best competition. When it comes to bass Beats are known for having a striking and what some would say an overpowering amount of bass. If you are wanting a lot of bass these aren’t the headphones for you, though the bass is still rather punchy and when compared with other top earbuds they are definitely above average. Connection Quality – If you didn’t know Beats were acquired by Apple not to long ago and Apple has built into the earbuds a chip called the W1 chip. You can hold the headphones next to your iPhone and a prompt will come up on the screen asking to pair the devices, very simple indeed. The chip basically makes connecting with any Apple device more seamless and simple. It’s also meant to preserve the battery life, though you only get them benefits if you are an Apple user, android owners will not. The range is very consistent and reliable. I definitely felt when testing with both an iPhone 6 and a Samsung S7(android), the range seemed a little better on the iPhone once you got further from the device (15+feet) this is probably due to the W1 chip inside. Though in both cases for most regular use, the connection remained stable and consistent throughout. The BeatsX Wireless are a solid offering with a lot of benefits and some downside. They are very comfortable, have a classy and stylish design. They are a great choice for any Apple device users thanks to being primarily designed for use with them. Also, the quick charge battery feature is a selling point which could sway some people, it’s really convenient and useful. Though on the downside their audio isn’t the best in the business though it definitely is good just not great – I would have liked to see a little more improvement on clarity and lows and mids. Overall if you are an iPhone user who prioritizes comfort along with an elegant design and some nifty features they are a great choice. The Bose SoundSport came around after Bose saw the success of the older Jaybird X2s. These same headphones were available in a wired option but now they have created a wireless option. The wired earbuds they have were one of my personal favorites but can their wireless counterpart match that quality? Inside the Box – You get the headphones inside, a carrying case with clip built in, a micro usb charging cable, 2 additional pairs of Bose’s “Stay Hear+” ear tips and the usual paperwork. Design and Comfort – When compared with the wired variant which are known to be very thin and slim. They are definitely a bit bulkier – this is obviously related to the battery and the Bluetooth functionality that is inside. Though they are a bit bigger than there wired brother they still don’t have any problem when it comes to staying in place. This is part and parcel due to the ear tips which for me are one of the best eartips and most well-fitting on the market. Though this does mean you can’t use other eartips that you may have from other headphones. The earphones also have wings which too help keeping them in place. In terms of buttons you have a pairing and power on button on the right earphone and you have an inline controller with the volume buttons along with a universal button for pause/play/answering calls. You can answer calls thanks to the built-in microphone as well. The way the controller sits stops it from getting thrown around when you are doing rigorous exercise which is nice. When it comes to materials they have used, everything feels premium as Bose is known for. The main part of the earbuds are made from a hard plastic. They are also fully waterproof which means for vigorous exercise or using outdoors in the wet no problem at all. Battery Life – They offer about 6-7 hours of playback time on one charge which isn’t great. It’s around average. Sound Quality – In terms of sound quality alone these are one of my personal favorites. The sound profile is extremely well defined and one of the best when it comes to the best Bluetooth earbuds. The bass is punchy and defined well and for me hits the sweet spot, a sweet spot that offers just enough bass without being overpowering. They have a great sound stage for earbuds and one of the best wireless earphones out there. Connection Quality – The connection range is great and they function well and consistently up to about 30 feet and for must general usage I rarely ever noticed the sound stutter or skip. They also have NFC which makes connecting a little simpler if you have a compatible device. 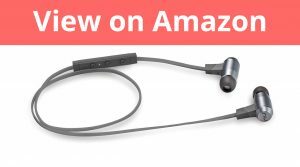 For me the Bose SoundSport Wireless are one of the best Bluetooth earphones out there and an Editors #1 Choice. They have excellent design and durability, are fully waterproof, hold in place well along with being comfortable and are some of the best sounding earbuds out there.